As the Government gets to grips with the benefits that can be had by conserving energy and new ways of harnessing energy, regulations will be put into place in an effort to change people’s outlook on energy saving. Understanding the regulations and being able to source the products that will enable the compliance with regulation can be a minefield. Crescent have several years experience with specialist renewable energy systems, suppling complete Solar Thermal systems to Rainwater Harvesting tanks. Energy Performance Certificates (EPCs) are needed when any building is sold, rented out, constructed or refurbished. EPCs give information on a building’s energy efficiency in a sliding scale from ‘A’ (very efficient) to ‘G’ (least efficient). 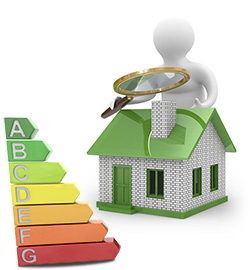 Every EPC also has a recommendations report showing how the homeowner could improve the rating. Only qualified, accredited domestic energy assessors and qualified, certified home inspectors can produce EPCs for domestic properties. They analyse how homes are constructed, insulated, heated and ventilated, and the type of fuel being used. We have brances in Maidenhead, Ruislip, West Ruislip, Hillingdon and Uxbridge. Crescent Buildbase, t/a Crescent Building Supplies Ltd is a trading division of Grafton Merchanting GB Limited, Reg. in England No. 4725313 VAT Reg. No. GB 128252676.